We find that our style checking program is particularly popular among people who are learning English as a second language (ESL) or for people who are translating their documents from their native language into English. These people may be working towards English fluency in speaking, but learning how to write in English is an entirely different skill that many ESL classes fail to teach. ESL students may learn the nitty-gritty rules of grammar, but still have trouble listening to their writing and identifying what works and what doesn't. That's when WhiteSmoke's online style checker will step in. Our program will enable such students of the English language to ensure that their work isn't just technically accurate, but that it flows well and contains no stylistic mistakes. 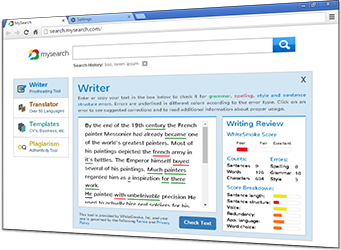 Of course our writing style checker is not intended for use solely by non-native English speakers. In fact, it is a popular tool in universities, law firms, and other business offices as well. In fact, anyone who writes anything will benefit from the ease-of-use and effectiveness provided by our style checker. With just the quick click of a button, your document will be scanned for stylistic errors and then corrected, leaving you with a brilliant piece of prose ready for submission or sending off. So whether you're writing a term paper, legal contract, business proposal, letter of recommendation, or a simply friendly email to your mom, we urge you to run it through our style checker – you won't just end up with a strong piece of writing, but you'll gain more confidence in your writing as well!